Windak Inc. welcomes all visitors to our booth 326. At IWCS Conference 2012 Windak will present its latest information about their products such as NEW Spool Winder SW6-14 and Automatic Reeler AR24. New Spool Winder 6 - 14 is a Fully automatic, in or off line, packaging and palletizing of wire, cable and other flexible products onto spools from 165mm (6.5”) to 360mm ( 14’’) in overall diameter. Spools are automatically loaded and unloaded into/from the spooling head. Outer ends are secured with stretch wrap. All operational parameters and mechanical settings are recipe controlled in order to reduce time between product and spool changeovers. Output of the new spooler is 3 spools per minute! The Auto Reeler AR24 is a fully automatic reeler developed for automatic packaging of cable and wire products on spools or reels between 298-609mm (11.75"-24") in overall diameter. 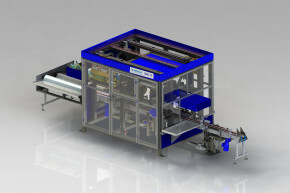 It can be run both in line (direct connection with Extruder) and off line and loads and unloads the empty reels automatically and includes stretch wrapping of spool to contain the cut end. The output of the machine is 2 reels per minute! It requires minimal floor space, and when combined with the integrated palletizer, makes a complete automatic spooling line with a short investment payback. Windak will also present the latest information about their full range of products such as: pay-offs, take-ups, rewind lines, coiling and spooling solutions, accumulators, and palletizers. We look forward to seeing you at our booth!